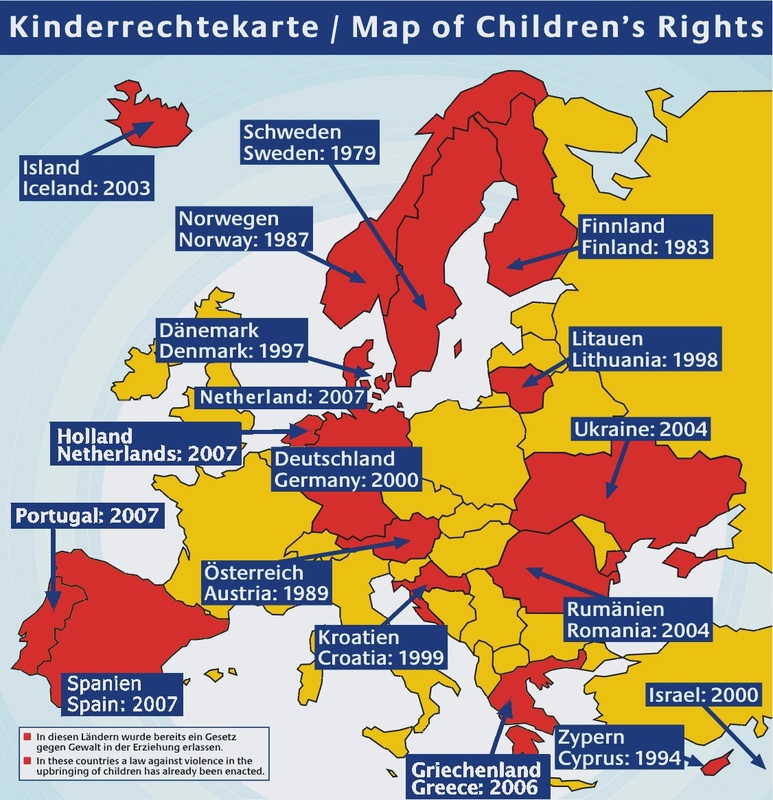 Already in 1979 Sweden has introduced the right of children to non-violent education, a law prohibiting corporal punishment and humiliating treatment ( see Children and Parents Code, Chapter 6, Section 1 ) of children in families. At that time 70% of the population were opposing the law and around 50% of parents were accepting corporal punishment as educational means. Currently more then 90% of Swedish parents endorse the law. Other European countries followed, Norway in 1987, Finland in 1993, Cyprus in 1994, Denmark in 1997, Lithuania in and Austria in 1998, Croatia in 1999, Germany in 2000, Iceland in 2003, Romania and Ukraine in 2004, Greece in 2006, The Netherlands, Spain and Portugal in 2007. Updated version of: Image Source: Bundesministerium für Familie, Senioren, Frauen und Jugend, Programme to European Conference from 20-21 October 2005, „Raising Children without violence“, p 20-21.